If you would claim or move power to your House, you must place it on a Brotherhood character you control instead. Opponents may choose and take power from your Brotherhood characters to fulfill the claim of Power challenges initiated against you. theres a few infamy decks built around using brotherhood characters and infamy charcters so that your opponent can't steal power off your charaters after winning a power challenge. 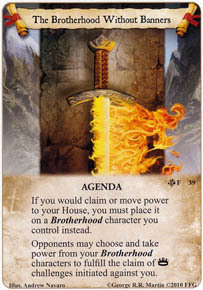 I seem to recall a thead on the FFG forums about still being able to put power on an infamy character even if you do have a brotherhood character out, but I can't find it and don't recall why on the ruling. Anyone else recall one way or the other? question: if i have 2 different BH characters with power on then and an opponent claim 1 power,who choose the character to lose the power? Your opponent, as the agenda says they choose the character. True, but they could blank her with Nightmares (LoW). I pulled that trick once against a Brotherhood player locally. Had him on 34 power before I finally won. Nightmares became a staple inclusion in his deck soon after, but I did enjoy that moment while it lasted. Sorry if I am being dense here but... what's the advantage of this agenda? "If you have no power on your house". The Agenda helps you to achieve this.